In an earlier post I wrote about some of the most common wildflowers found in the Cascade mountains of the Pacific Northwest, especially how they make fine subjects for close up photos (Pacific Northwest Natives Up Close). On that trip, wildflowers hugged the trail up Sauk Mountain; it was hardly ever necessary to leave the trail to find a suitable subject. Earlier this week I made a quick trip to Mt Rainier, hoping to photograph more wildflowers. The trails around Paradise are well maintained for the hordes of tourists that flock to the mountain. 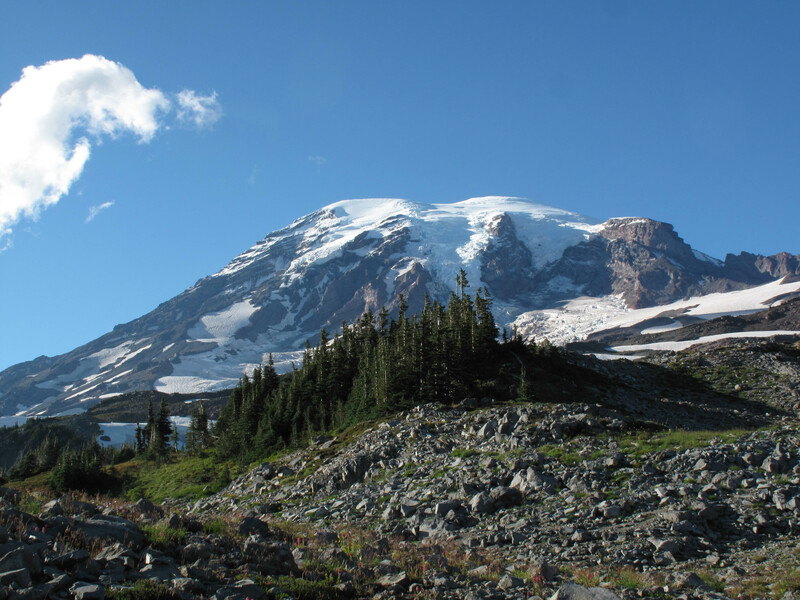 Visitors are implored not to leave the trail and respect the sensitive surrounding meadows. I did manage to find a meadow, a bit further afield, where I could safely get closer to two plants, Gentiana calycosa and Mimulus lewisii. 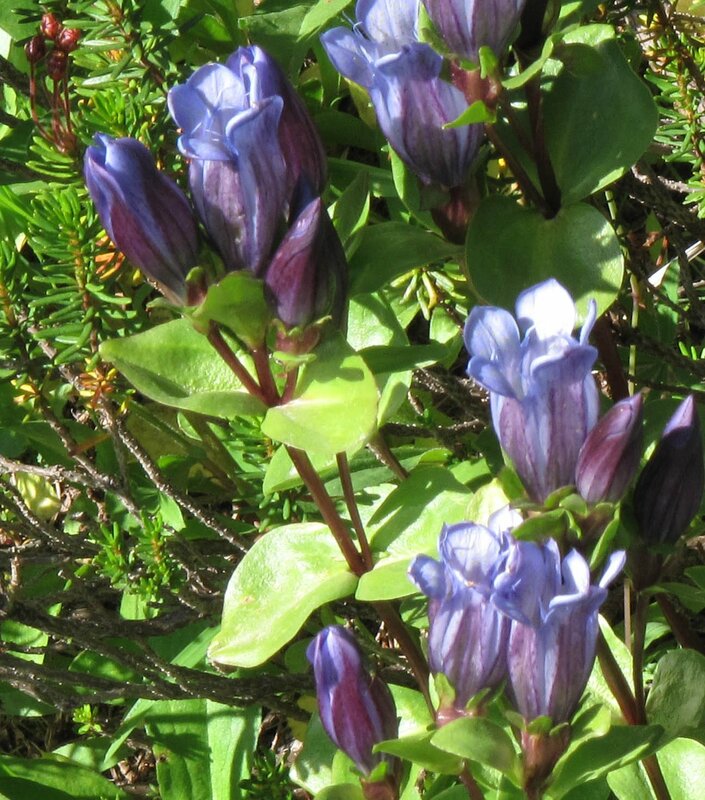 The Explorer’s Gentian, aka Mountain Bog Gentian, has upward pointing flowers of a lovely shade of blue with some yellow spots in the throat. This species tends to be found in the wetter parts of meadows. It’s definitely a common sight in late summer or early autumn near stream banks, alpine meadows and other wetter sub-alpine habitats. It ranges from the Sierra Nevada and Klamath Mountains in Northern California into the Cascades and a bit of the Coast Range of Oregon and continues throughout the Cascades and Olympics of Washington State. Another common wildflower, Mimulus lewisii, sometimes called Lewis’s monkeyflower, has flowers that range from pink to a bright rose with yellow splashes in the throat. Mimulus lewisii also grows in wet areas alongside stream banks and meadows. 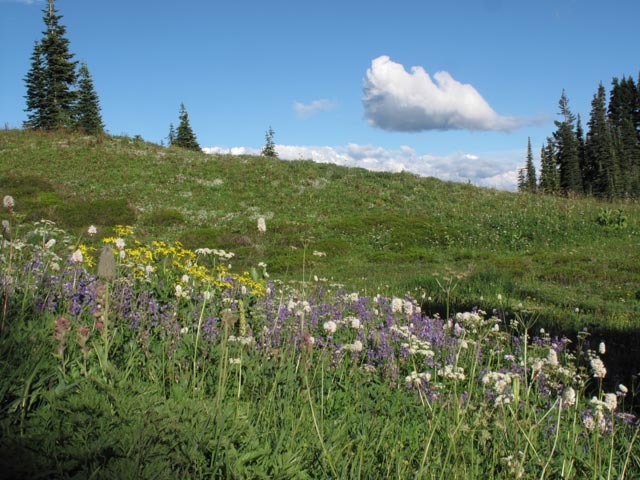 It’s a wide ranging and very common western native alpine, which is also found in sub-alpine and forest areas in and adjacent to the Rockies, Sierra Nevada mountains and throughout the Cascade and Olympics of Washington State. The pink flowers may range in color from lighter shades to deep pink and magenta. Its also one of the many species (and a single genus) bearing the name of Meriwether Lewis, who certainly qualifies as an “explorer,” while the Genus Gentiana is named for King Gentius of Illyria, who lived around 500 B.C. According to Mark Turner and Phyllis Gustafson’s Wildflowers of the Pacific Northwest, King Gentius is alleged to have discovered medicinal uses for Gentiana lutea, from which a tonic of bitters is still made. 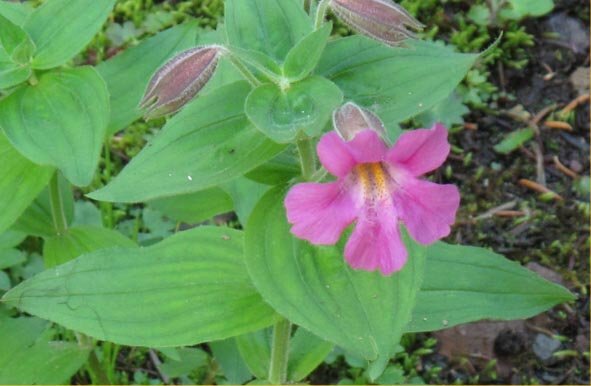 This entry was posted in Pacific Northwest Natives and tagged Explorer's Gentian, gentiana calycosa, Lewis' Monkeyflower, Mimulus lewisii, Mt Rainier wildflowers by Bart Arenson. Bookmark the permalink.